You will meet your guide at the designated meeting point. 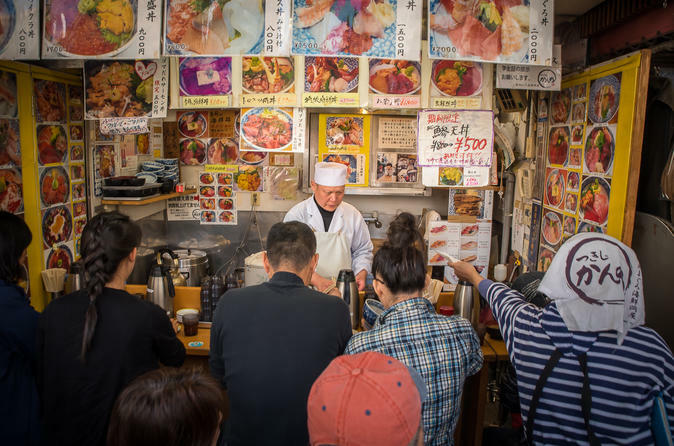 Your guide will provide you with an overview of the tour over a delicious cup of coffee, one of Tokyo's bests.Soon after you will walk around the outer market with around 700 stalls in the fish section and 120 shops in the fruits and vegetables section, each unique in their very own way. Spend time strolling about the inner wholesale market, seeing some of the world's best seafood specialists that give Tsukiji its world-famous culinary reputation. You can also stop to get a blessing at the local shrine. You will stop for tastings along the way. You will then continue exploring the bustling outer market where you will try famous dishes from the area, learn about the history, controversy and possible future of the market community and end your tour with a delicious sweet snack. During the outer market experience you will find many great products which you may want to purchase. Most vendors do not take credit cards, so please bring cash in the local Japanese currency. Many guests like to purchase a Japanese cooking knife as a souvenir of their Tsukiji day. Knives range from 5000 yen to 70,000 yen or more (50.00USD to over 700.00USD).